Internationally recognized as one of the world’s finest quartets, the American String Quartet has spent decades honing the luxurious sound for which it is famous. The Quartet will celebrate its 40th anniversary in 2014, and, in its years of touring, has performed in all fifty states and has appeared in the most important concert halls worldwide. Their presentations of the complete quartets of Beethoven, Schubert, Schoenberg, Bartók, and Mozart have won widespread critical acclaim, and their MusicMasters Complete Mozart String Quartets, performed on a matched quartet set of instruments by Stradivarius, are widely considered to have set the standard for this repertoire. Resident quartet at the Aspen Music Festival since 1974 and at the Manhattan School of Music in New York since 1984, the American has also served as resident quartet at the Taos School of Music, the Peabody Conservatory, and the Van Cliburn International Piano Competition. The Quartet’s diverse activities have also included numerous international radio and television broadcasts; including a recording for the BBC in May 2012; tours of Asia; and performances with the New York City Ballet, the Montreal Symphony, and the Philadelphia Orchestra. Highlights of the Quartet’s 2013-14 season include performances of an all-sextet program with Roberto and Andrès Dí­az, a tour of South America, and performances of the complete Beethoven cycle of string quartets in Israel — the ensemble’s fourth visit to the country in as many years. The American’s additional extensive discography can be heard on the Albany, CRI, MusicMasters, Musical Heritage Society, Nonesuch, and RCA labels. Most recently the group released “Schubert’s Echo,” which pairs Schubert’s monumental last quartet with works bearing its influence by Second Viennese masters Alban Berg and Anton Webern. This repertoire posits that the creative line from the First to the Second Viennese Schools is continuous — and evident when these works are heard in the context of each other. The CD is on the NSS Music label, a new enterprise by Nadja Salerno-Sonnenberg devoted to intellectual projects that are frequently overlooked by major labels. 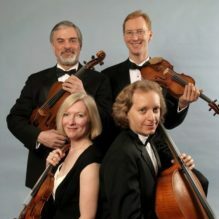 The Quartet’s innovative approach to concert programming has won them a number of notable residencies in recent years, including “Beethoven the Contemporary” at the University of Michigan, “The Six Mozart Viola Quintets” at the Aspen Music Festival with Guarneri Quartet violist Michael Tree (broadcast live nationally via Chicago superstation WFMT), and a four-year cycle entitled “4-5-6…” at Princeton University, where the Quartet performed the complete quintets and sextets of Mozart and Brahms, joined in each concert by renowned guest artists. As champions of new music, the American has given numerous premieres, including Richard Danielpour’s Quartet No. 4, commissioned by Kansas City Friends of Chamber Music, and Curt Cacioppo’s “a distant voice calling,” commissioned by Arizona Friends of Chamber Music. In January 2009, the Quartet premièred Tobias Picker’s String Quartet No. 2 in New York City in celebration of the 90th anniversary of the Manhattan School of Music, and in May 2011 the Americans premiered Glen Cortese’s Four Dances for String Quartet and String Orchestra, a work commissioned by the Oregon Mozart Players. Formed when its original members were students at The Juilliard School, the American String Quartet’s career began with the group winning both the Coleman Competition and the Naumburg Award in the same year. Individually, the members devote additional time outside the Quartet’s active performance and teaching schedule to solo appearances, recitals, and master classes.